With Rit All-Purpose Dye you can dye fabrics containing natural fibers, like cotton, linen, wool, or silk, and also rayon and nylon. It comes in a variety of colors that you can mix to get an infinite amount of colors. If you want to dye polyester and other synthetic fibers, use Rit DyeMore Synthetic Fiber Dye. Read our article on fabric dye for more information about the dyes we carry. Browse all Rit dyes here. As a general guideline, for every pound of fabric, use ½ bottle of liquid dye or 1 package of powder dye in 3 gallons of water. To get dark or saturated colors, double the amount of dye. I’m going to dye samples of a bunch of different fabrics with Rit All-Purpose Fabric Dye and see what happens. Pre-wash the fabric to remove any finishes so the dye will absorb better. Use enough water so the material can move freely. The hotter the water, the better, so use really hot tap water or heat the water until it’s almost boiling. 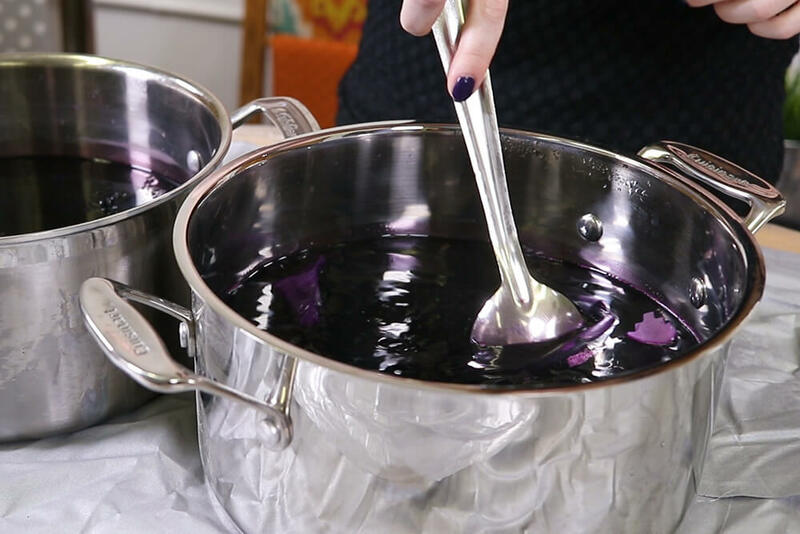 From here you can use the stovetop method where you keep the dye bath on a low simmer throughout, which will get the darkest, richest colors. 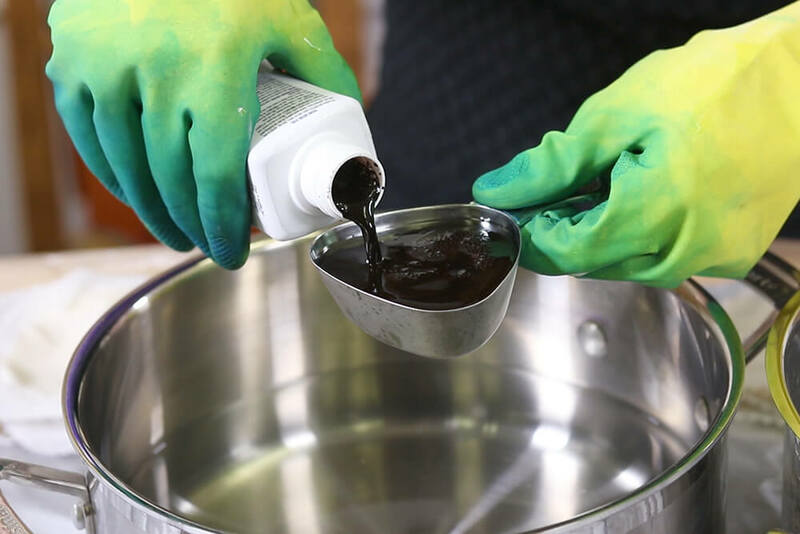 Or you can dye in a container or a stainless steel sink. Wear gloves whenever handling the dye and cover any surfaces that need protection before starting. I’m dyeing the samples in 2 batches because some of the fabric likes salt added and some likes vinegar instead. Shake the dye well and add it to the water. As a general guideline, for every pound of fabric, use ½ bottle of liquid dye or 1 package of powder dye in 3 gallons of water. To get dark or saturated colors, double the amount of dye. I’m using about ½ a cup in each to get a very saturated purple. 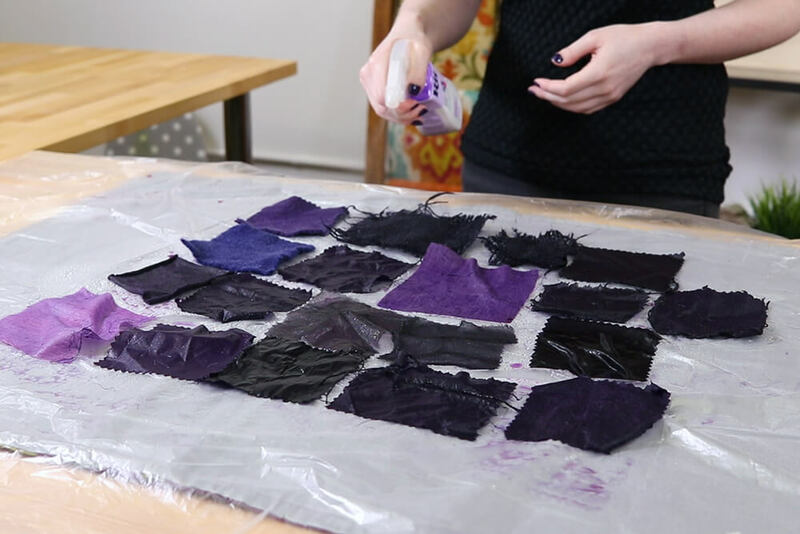 You can test out the color by dipping a piece of paper towel in the dye bath. Add more dye or more water if needed. 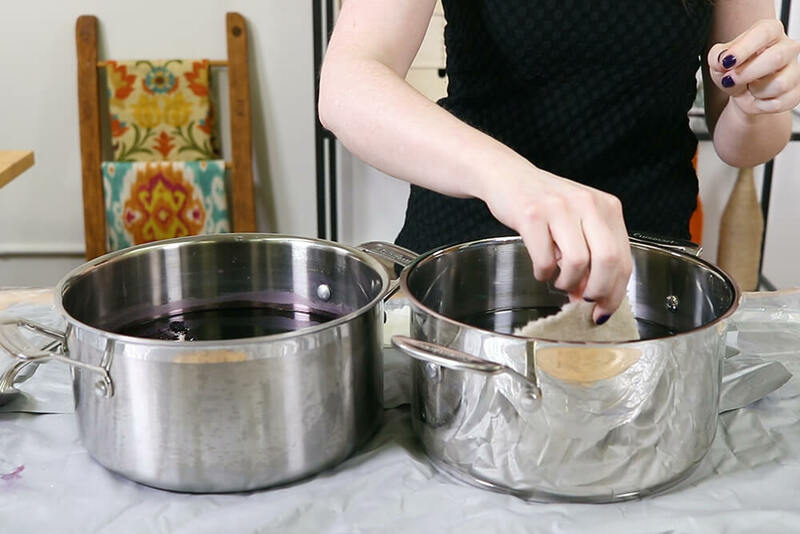 Add salt to the dye bath for cotton, linen, and rayon fabrics, or add vinegar for silk, wool, and nylon fabrics. I’m adding about half a cup of each, but add more for larger projects. Stir well. Put the already wet fabric in the dye bath. Stir continuously for about 30 minutes. Take it out sooner for lighter colors or leave it longer for darker colors. Make sure the dye is getting to all parts of the fabric so it won’t be splotchy. When your fabric reaches your desired color remove from the dye bath. Keep in mind, fabric looks darker when wet. 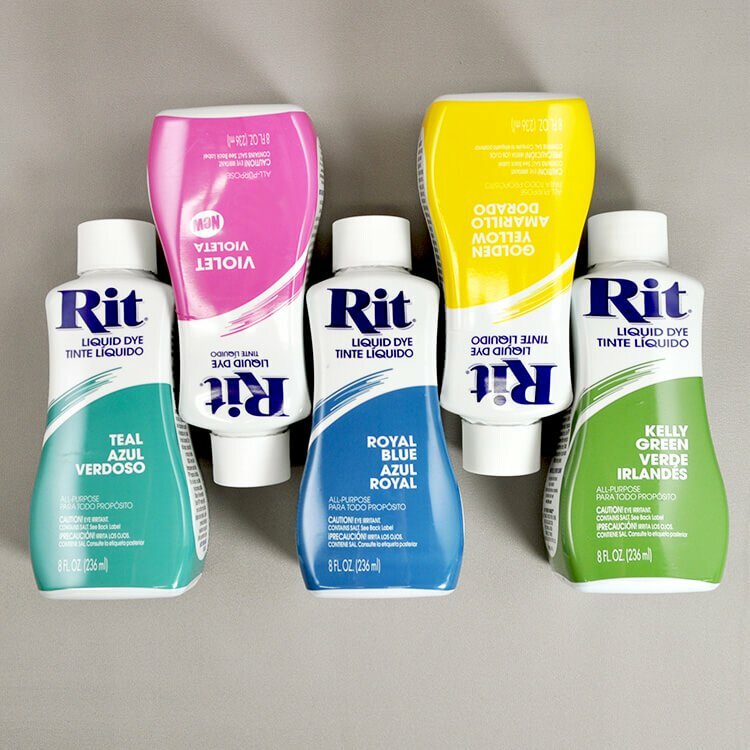 We suggest using Rit Color Stay Fixative before rinsing to increase color retention and reduce bleeding. This is very effective on natural fibers, but won’t make a difference on nylon fabrics. 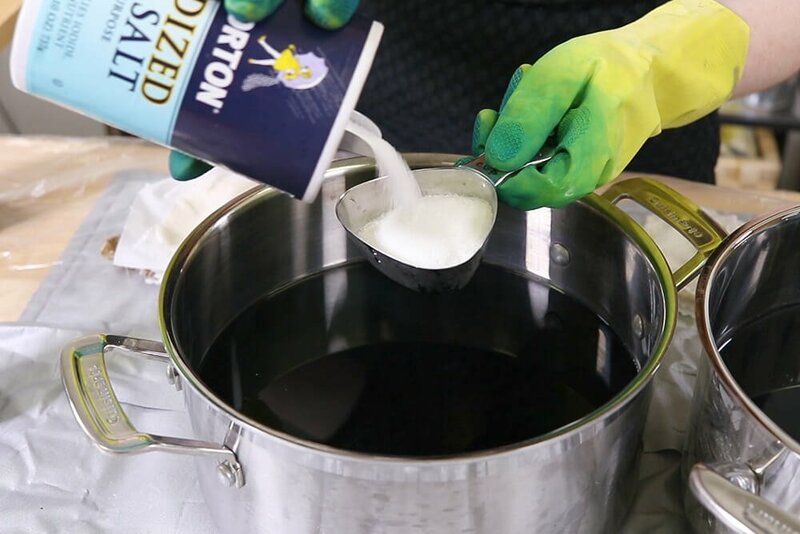 For small projects you can spray the fixative directly on the fabric until saturated, or for larger items, mix it in a water bath according to the instructions on the bottle. Let sit for 20 minutes. Rinse with warm water, then cooler water, until it runs clear. Finally, hand wash or machine wash with warm water and hang to dry or tumble dry with an old towel. Dry clean only and fabrics that can’t withstand heat shouldn’t be dyed, but if you want to try, test out a small piece first. Keep in mind most clothing is made with polyester thread which won’t dye with Rit All-Purpose Dye. Dyeing white fabric has the best results. You can dye other colors, but the original color will affect the outcome. You can use Rit Color Remover first to get rid of as much color as possible. The fabrics ended up dyeing a range of colors. These differences are mainly due to the different fiber contents. 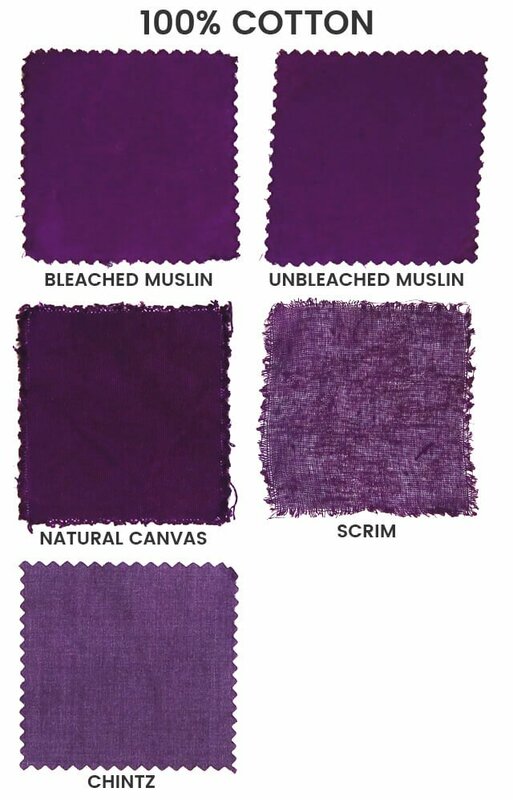 Whether muslin is bleached or the natural unbleached color may make a difference for light colors, but for dark colors like this purple, it isn’t noticeable. Similarly, with light colors you may be able to see the dark specs in natural canvas, but not for darker colors. This canvas is pretty thick and dyed a little darker than the muslin. Scrim has a very loose weave but dyed as well as the other cottons. Chintz has a shiny surface that dyed a little lighter. It still has a sheen but doesn’t appear quite as shiny as before it was dyed. The amount of polyester in a fabric affects the darkness of the color. Here we have 3 broadcloth fabrics with varying amounts of polyester. The 100% cotton Kona broadcloth dyed very dark (darker than the cotton muslin of a similar weight), the 65% poly broadcloth dyed a light-medium color, and the 80% polyester is very light. Note that the poly cotton broadcloths aren’t a solid color because the cotton and polyester fibers aren’t smoothly and evenly blended. Cotton jersey has a bit of spandex in it, but that didn’t make a difference in the color. You generally won’t see a difference in fabrics with a more than 90% cotton content. The raw edges of jersey tend to roll, so just be aware of this because the edges may not dye evenly. 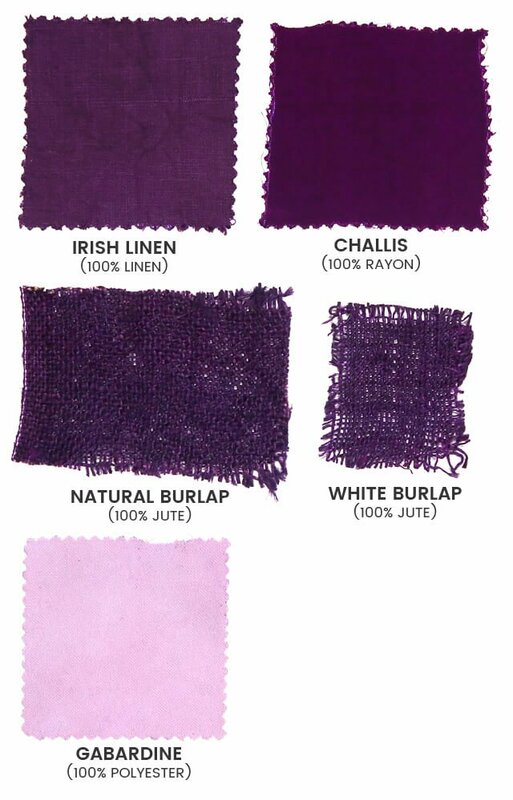 The linen dyed just as well as the cotton to a nice rich purple. Rayon is a semi-synthetic fiber. The material is actually a natural cellulose (like wood pulp), just created with a more synthetic process. Challis is 100% rayon and dyed to the same color as cotton and linen. Since jute is also a natural fiber, the burlap dyed nicely as well. The natural color of jute is fairly dark, so light and medium colors will be affected. There isn’t a noticeable difference between the natural and white burlap with this dark color. 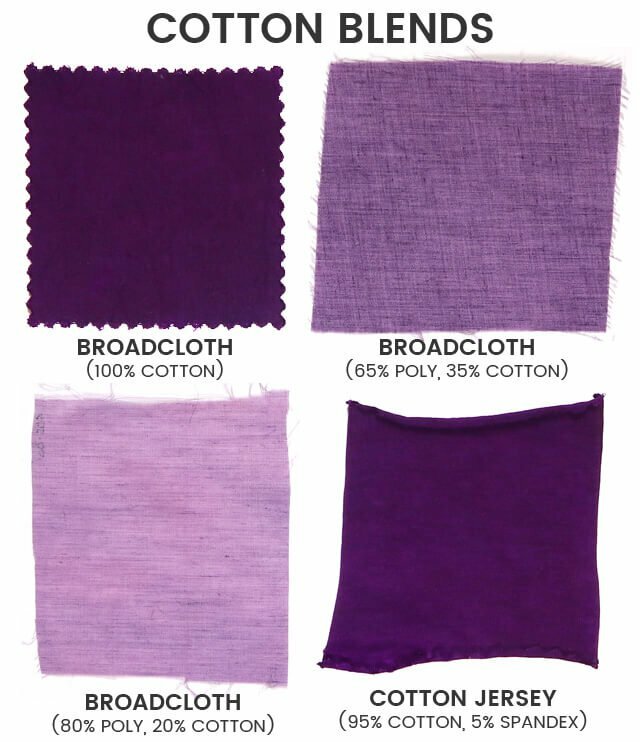 The hue of the purple is more blue than that of the cotton, linen, and rayon fabrics. I threw in a 100% polyester fabric just to see what would happen. This gabardine did actually dye a little to a light pink color. This may fade with more washes. The silks dyed more muted colors and also a bluer hue of purple. The silk chiffon dyed well and is darker than it looks when you layer it. 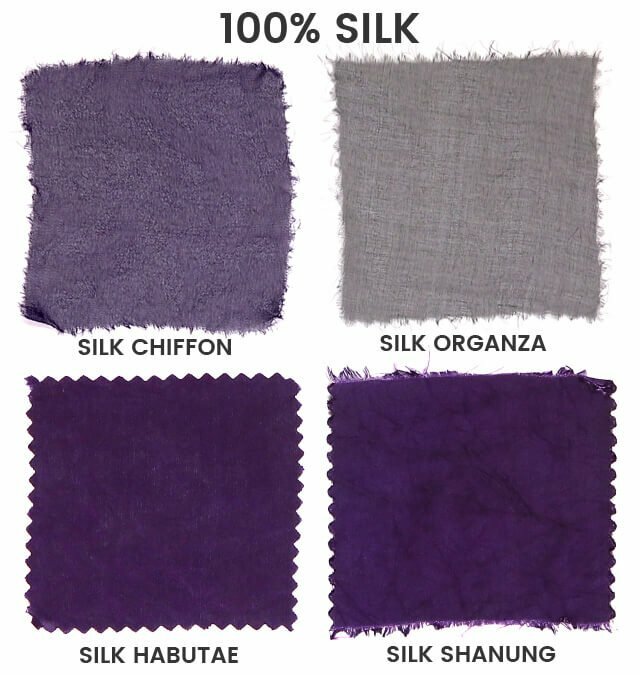 The silk organza interestingly doesn’t look purple. It looks closer to black when layered. 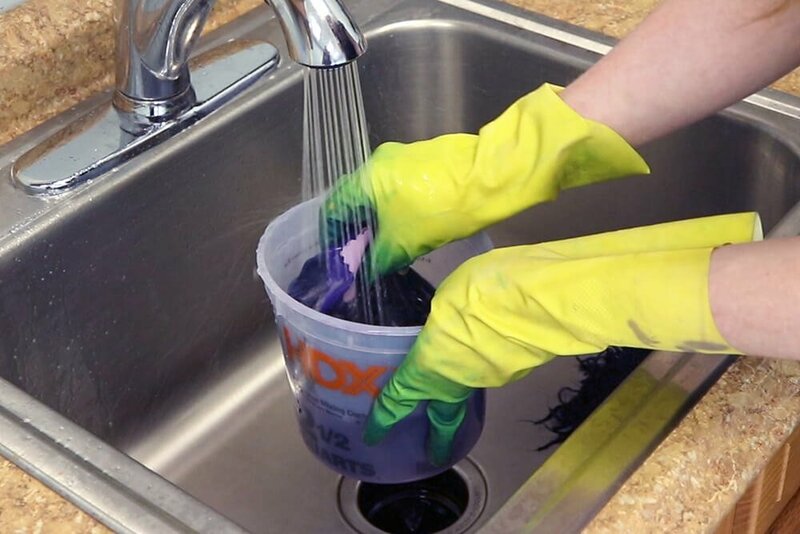 It’s possible that if less dye were used, it may have appeared more purple. Other colors will get different results. The silk habutae dyed pretty well, but the silk shantung got wrinkles that weren’t easily ironed out. These wrinkles may have caused it to dye a little unevenly. The nylon fabrics definitely have a bluer hue than all the others. The coated nylon oxford fabric dyed a medium purple, but the other side (probably the coated side) dyed much lighter. 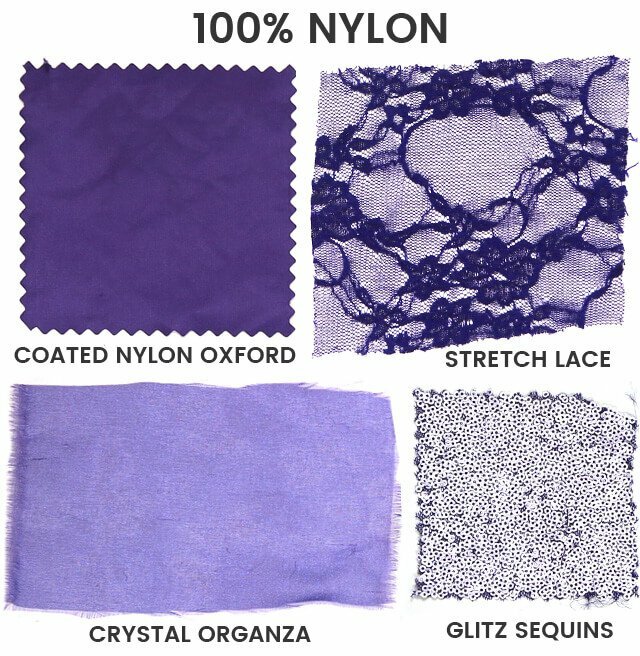 We also tried dyeing the stretch lace, crystal organza, and glitz sequins with the Rit DyeMore Synthetic Fiber Dye with quite different results. 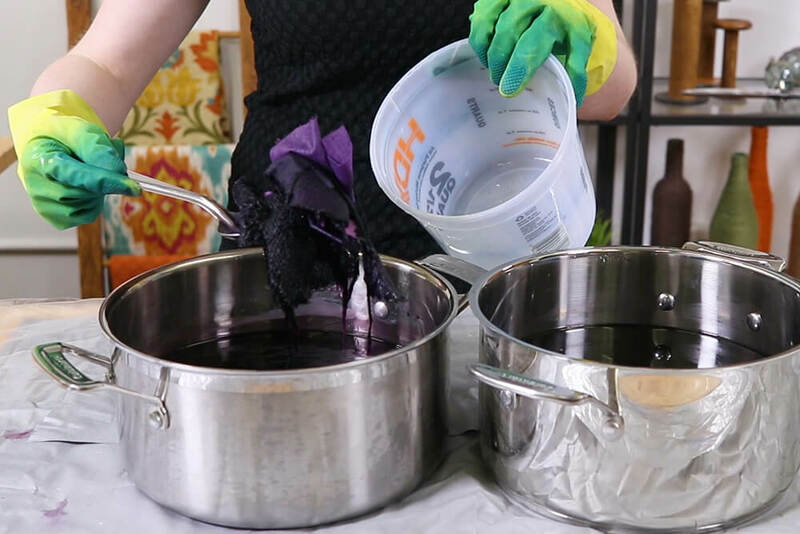 The stretch lace and crystal organza dyed better with this Rit All-Purpose Dye. The colors are definitely more saturated. This could vary by color and the length of time the fabric is left in the dye. Nylon dyes very quickly and darkly with Rit DyeMore. The crystal organza seemed to loose a lot of its sparkle with the Dit DyeMore, but here it turned out just as sparkly as before it was dyed. The glitz sequins definitely turned out better with Rit DyeMore. Although the sequins didn’t dye a dark color with the DyeMore, they didn’t dye at all in the Rit All-Purpose Dye. The backing dyed darkly with both dyes. 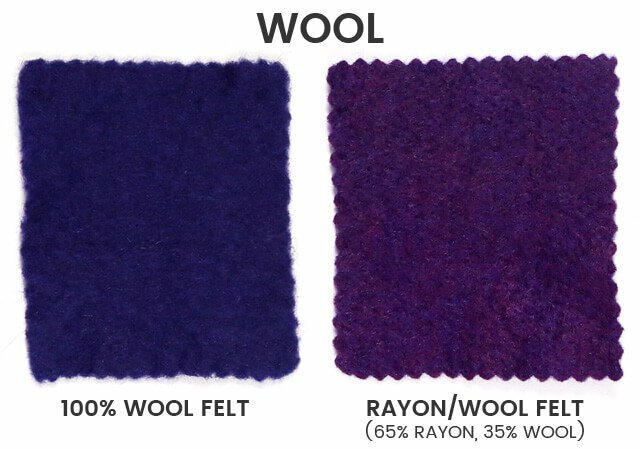 The 100% wool felt also dyed much bluer than the cotton, linen, and rayon fabrics. You can see the difference with the rayon/wool blend felt. A slight variation in hue can be seen in the blended wool because of the different fibers. They both dyed darkly. 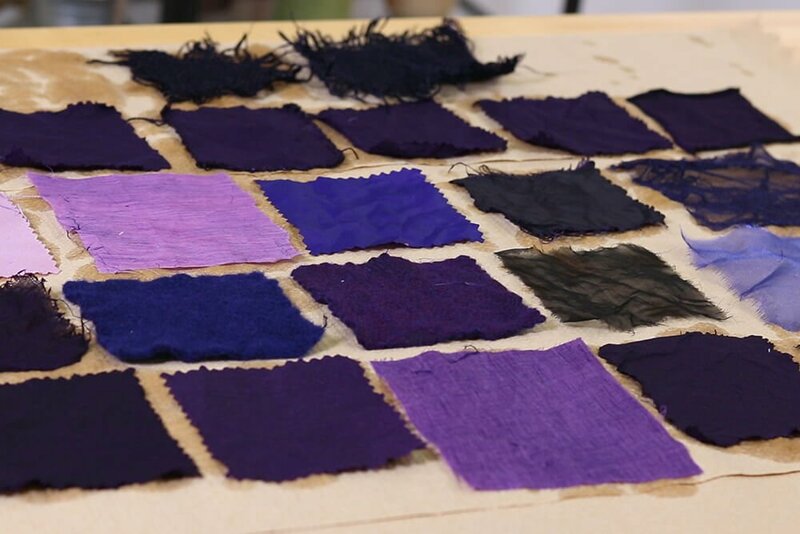 I also want to note that when I ironed the samples after they were dry, many of them turned a warmer shade of purple and appeared to stay that hue even when cooled. This purple is the only color I’ve noticed changing when ironed. 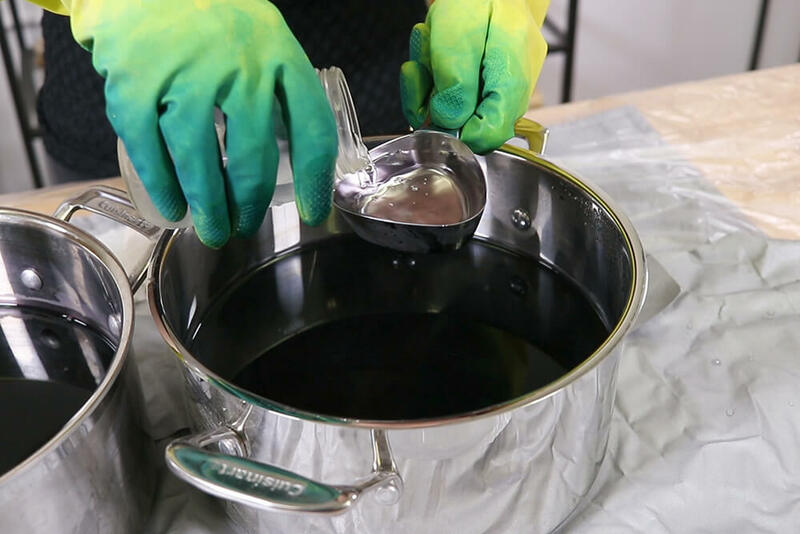 Try it out these techniques for yourself with Rit Dye. I have a garment that I have to touch up that is a medium corral color. How can I achieve this with Rit? Which shade of purple did you use for this? Can I use the dye more line on 95% cotton? Can I dye my outdoor cushions made with olefin fabric?